Ervin W. Splatt, age 93, Almena, WI entered into eternal life peacefully on Sunday, February 10, 2019. He was born December 14, 1925, the son of Gustav and Elsie (Kunkel) Splatt in Almena, WI. He grew up on the family farm and attended Midway School. He graduated from Turtle Lake School in 1943. When Ervin was 18 years old, he joined the Navy, where he was handpicked to join the Marines. During WWII, in 1944, he was stationed at the Philadelphia Navy Yard in Philadelphia, Pennsylvania. Not long after the war ended, he was honorably discharged and went back home to the family farm. Soon after returning to the Almena/Turtle Lake area, he met Rosemary, the love of his life. On May 14, 1949, he married Rosemary L. Thomas in St. Paul at the Holy Family Catholic Church. They lived on Ervin’s home farm and farmed for over 30 years. They sold their farm and moved to their new home on Upper Turtle Lake in 1978, where everyone enjoyed picnics lakeside, living there until moving into their duplex in 2003. Ervin continued to live there until December, 2017, when he moved to Dove Healthcare in Rice Lake. 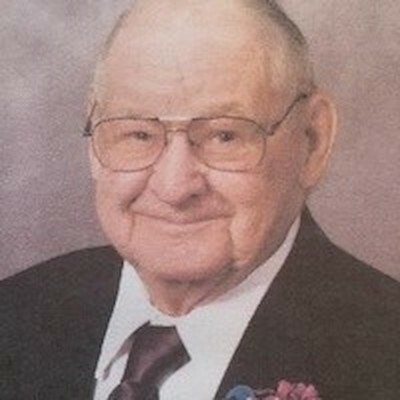 Ervin was a life-long member of Zion Lutheran Church in Almena. In his earlier years, he enjoyed snowmobiling, hunting, fishing, and driving his tractor in the local tractor pulls and parades. He played golf 3 times a week in leagues in Barron and Clear Lake, where he was the oldest member of the club. Ervin and Rosemary spent time traveling all over, including Hawaii, New Orleans, California, Washington, New York and Mexico, to name a few favorites. They also enjoyed many vacations with their daughter, son-in-law and grandchildren in the motorhome. A few of the favorites were Memphis, South Dakota, Michigan, Minnesota, Wyoming, Montana, Colorado, and Canada. Ervin was a wonderful husband, supportive father and grandfather, a good brother, uncle, and friend. Ervin is survived by his daughter Sandy (Ken) Mathieu of Cameron; granddaughters Lisa (Jason) Murphy of Almena and Tara (Phil) Jossart of Cameron; great-grandchildren Tyler and Taya Jossart, Mikayla and Carter Mathieu; nieces and nephews (great and great-great); cousins; and many close friends and other relatives. Ervin was preceded in death by his wife Rosemary in 2013; his son Ervin Michael “Mickey” Splatt in 2011; his grandson Steve Mathieu in 2008; his parents Gustav and Elsie; sister Dorleen and brother-in-law Clyde Nedland; his sister Freda and brother-in-law Clifford Hutchinson, and other friends and relatives. Funeral services will be held at 11:00 a.m. Saturday, February 16, at Zion Lutheran Church in Almena with Pastor Ellery Groth officiating. Visitation will be held from 4:00 until 6:00 p.m. Friday, February 15, 2019 at Rausch and Steel Funeral Home and one hour prior to the services at the church on Saturday. Burial will be at Wayside Cemetery in Barron. Arrangements are being handled by Rausch and Steel Funeral Home in Barron.